Today data sources are still not detailed enough to support competitive decision-making, and that’s what makes Drillinginfo (DI) so innovative: The DI platform offers the most inclusive, accurate, and fastest information available, allowing OFS companies to make informed decisions and drive the best leads — that can turn into opportunities. With DI, OFS companies can now make rig data useful quickly and easily. Sales managers can work crucial data into an actionable format, provide and implement the right analytical tools, and supplement lead intelligence, so operators don’t get left in the dust. From permitting and leasing information to rig locations and pricing trends, you’ll find innovative products and solutions from DI to help transform how your team qualifies leads and closes deals. See how Drillinginfo can drive your success by gathering the very latest rig intelligence from a comprehensive, easy-to-use SAS solution. Record-level drilling has made the Eagle Ford Shale one of the hottest plays in the industry. Do you have the crucial rig information you need to qualify leads? Learn how to get the most accurate, timely drill-site and well data, while making the most out of every opportunity. The DI Rigs Mobile App ensures OFS professionals have the tools, information, and support necessary to stay ahead of the competition. Using the power and convenience of mobile, our app will streamline your business and help you pinpoint and capitalize on the hottest leads. 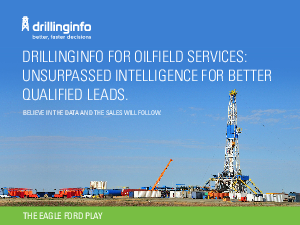 Learn more about making smarter, faster decisions based on unsurpassed rig intelligence in the Eagle Ford Play by downloading the PDF here.